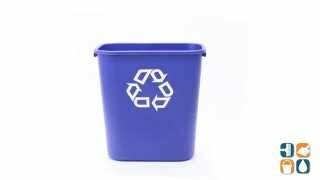 Doing your part in ensuring recycling is a part of your everyday life does not have to be a challenge. 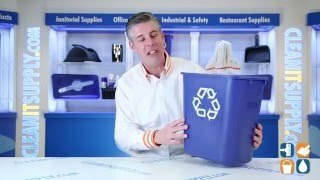 The perfect addition to any environment where recycling is emphasized, Rubbermaid recycling containers are a sure way to make a positive environmental impact. 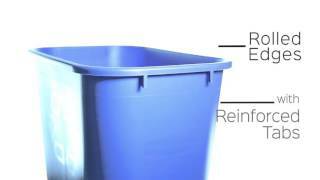 Rubbermaid recycling containers exceed EPA guidelines for post-consumer recycled content and assist in obtaining LEED credits. The dimensions of the 28-qt. 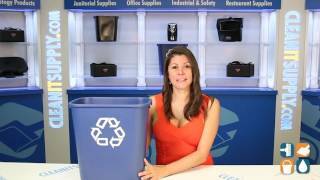 Rubbermaid recycling containers are 14.4" L x 10.2" W x 15" H. Ideal for any office complying with today's recycling requirements. We use this product in our classrooms and offices. 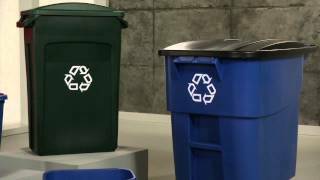 I work in an elementary school, and it would be nice to have the word Recycling on the containers as well as the symbol. It would be a good reinforcement for relating the word and the symbol for the little ones.